A new smartphone app aimed at helping GPs provide palliative care to patients has been created with the help of researchers from Adelaide's Flinders University. "Palli-aged" provides information on end-of-life care, including what to do at different stages of a patient's decline. 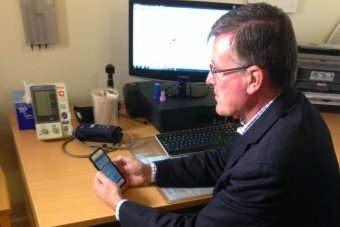 Adelaide GP Daniel Byrne said some doctors may only have a few palliative care cases each year, making the app extremely helpful. "When we're treating diabetes, blood pressure and asthma, we're doing that every day, it's at the front of our mind, but something like palliative care, it's really good to have that information at our fingertips," Dr Byrne said. "They've made it really GP friendly, because it's all the type of medications we can prescribe in the community. "A lot of palliative care medications are hospital-only drugs, so there's no point having an app that tells you to use this drug, and you find out, oh I can't prescribe it." Associate Professor Jennifer Tieman from Flinders University said the app brought together information from various resources, to ensure GPs had it all at their fingertips. "So it was translating what's a lot of knowledge that's already been put together into something that's quite usable and very user friendly for GPs to be able to look at immediately and say 'how do I know how my patient's travelling, what do we to do next?'" she said. "And at the point where they're actually dying, how do we take care of symptoms and provide care for them in the home or in the residential aged care setting?" When GPs are assessing older patients, the app poses the question "how long do you think the person has left to live?" A lot of GPs probably don't have quite the confidence, but with this app I'm sure that will grow, and for people who want to care for a dying relative at home, that will only be very helpful. If the prognosis is longer than six to 12 months, it encourages advance care planning, such as what the patients wishes are and appointing a decision maker. If the prognosis is less than six months, the app advises a case conference, which brings together the patient, family and health professionals to review treatment plans. For a patient in their final days, the app provides information on terminal care, including establishing where they will end their life. Palliative Care SA chief executive Tracey Watters said the app would give GPs the confidence to treat palliative care patients. "A lot of GPs probably don't have quite the confidence, but with this app I'm sure that will grow, and for people who want to care for a dying relative at home, that will only be very helpful," Ms Watters said. Dr Tieman said with an ageing population, the demand for GPs in palliative care would also grow. "We're not all going to live to be 150 so there are going to be more people who are coming naturally to the end of their life, and GPs have a critical role to play," she said. The app has been downloaded more than 1,000 times since its release three weeks ago.